Oxfam is working on a solar energy pilot project that is bringing renewable energy to Kpatua village, in northeast Ghana. 10 households have been provided with a solar panel, three LED lights, and a battery to store energy so they can use lights at night. She has a better option now. She can draw clean water from a tap connected to a 450-liter tank filled every day by an electric pump powered by 10 solar panels that can generate 1,800 watts. “When they installed the system and turned the valve on, I filled all my pots and water containers, and I shouted to all the other women to come get water. I was so happy. I had never filled all my pots before.” says Felicia. The new well was installed by Presbyterian Agricultural Station in collaboration with Oxfam, as part of a solar energy pilot project that is bringing renewable energy to 10 households, the primary school and health clinic, and provided individual solar lamps to 100 homes in Kpatua, a village of about 110 families in the farthest northeastern corner of Ghana. Felicia Ayaawin draws water from the well Oxfam’s partner installed near her home in Kpatua. The well has an electric pump powered by solar panels, and water is stored in a large tank. While the project is still in its infancy, there are already signs of community progress. Gocker Kwesi Musah, the head teacher at the primary school, says solar energy has brought major improvements. Two large batteries help the school store power to illuminate classrooms in the evening, so students with no lights at home can study after sundown. 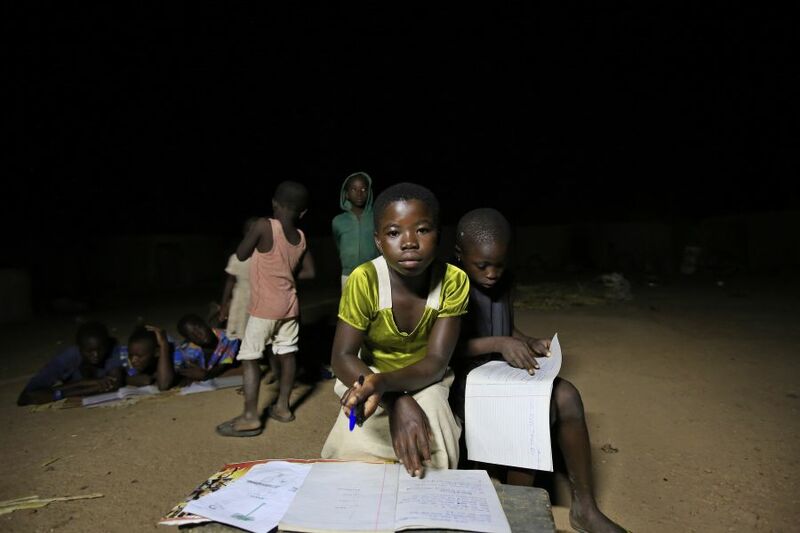 Children study in the evening by the light of a solar-powered lamp at the home of village chief Mbil Ayaada. Latana Ganda, the 26-year-old nurse at the village health clinic, says she used to travel about 7.5 miles to Garu, a nearby town with electricity, to get vaccines and ice packs, and bring back any unused vaccines at the end of the day. “Now with the solar fridge,” she says, “we don’t have to go every day, and we use a lot less fuel.” It’s easier to vaccinate children, keeping them healthier. Solar-powered batteries at the clinic help her better respond to emergencies at night, and they run the refrigerator. 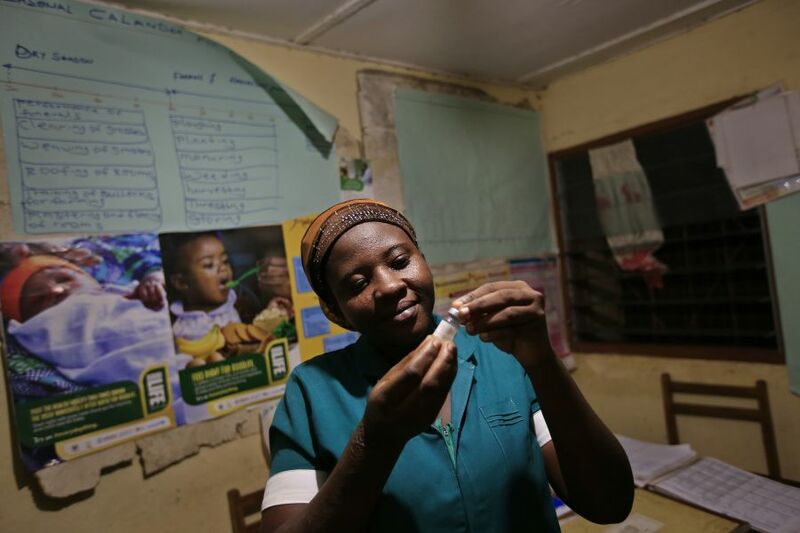 Latana Ganda, the nurse in Kpatua’s clinic, inspects a vaccine she stores in a solar-powered refrigerator. The solar energy system charges the batteries she uses to run the refrigerator and power the lights at night, so she is better able to handle emergency cases. Mbil Ayaada, the chief of Kpatua, is one of the 10 homesteads with a solar light system. It includes three LED lights, which are highly energy efficient, and a light with a motion detector installed near the entrance to his compound, where he keeps livestock at night. It’s all powered by 10 panels and a battery. “You can see children in the evening, they’re all learning, I really like that. The solar lights help us at night to prepare food, and we don’t have to buy batteries or kerosene for lamps any more. It’s been a great help, and it is a saving for the community,” Ayaada says. 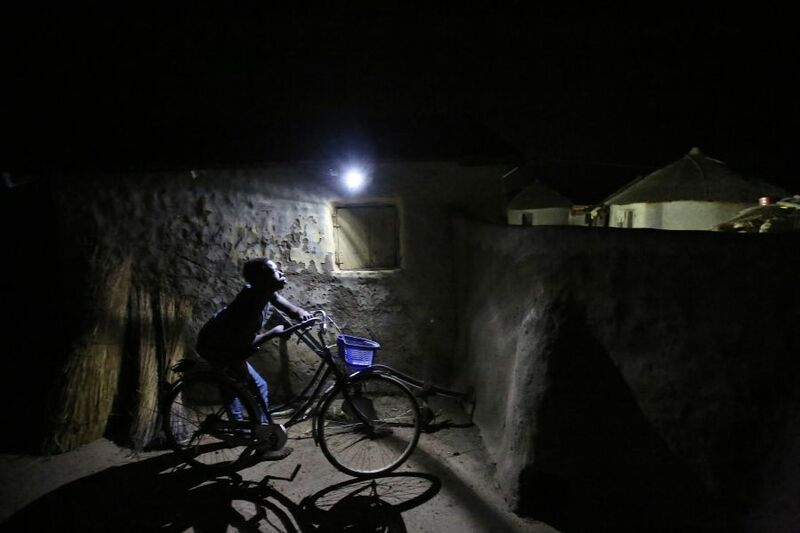 A boy passes by a motion-activated LED light in Kpatua village. The solar energy system at this home generates and stores electricity for night-time use. In the next phase of testing, the plan is to pump water from the solar well out to fields so villagers can grow vegetables in the dry season, a time when otherwise many people migrate to different parts of the country to look for work. But some locals are not waiting to test the idea; they’re already sold on it. Felicia Ayaawin and her husband grew a few tomato plants over the summer with water from the nearby well. She had three beautiful tomatoes in a bowl at her home. She sees the potential for her family, and her village, to grow more with water pumped with electricity from the sun.